Adds a new row to the grid. rowHeight The height of the row when it stays empty, or the minimum height when objects are added to the row. Add a new object to the next column. 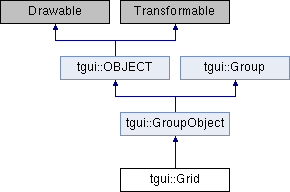 object Pointer to a fully created object that will be added to the grid. borders Distance from the grid square to the object (left, top, right, bottom). layout Where the object is located in the square. Changes the layout of a given object. Returns the size of the grid, after the scaling transformation. Returns the size of the grid, unaffected by scaling. Removes a single object that was added to the group. object Pointer to an object that was added to the group with the add function. Removes all objects that were added to the group. Changes the size of the grid. By default, the grid will have the size of the objects that were added to it. When changing this size, all objects will be scaled to fit inside the grid with this fixed size. This function will change the scale factors. width Sets the new width of the grid. height Sets the new height of the grid. Updates the position and size of the object. After an object has been added to the grid, you will have to call this function when you change the size of the object.